Venezuela's Hugo Chávez Says Tumor Is Cancerous : The Two-Way The Venezuelan president denied rumors that the cancer had spread, but said the new growth would require radiation therapy. 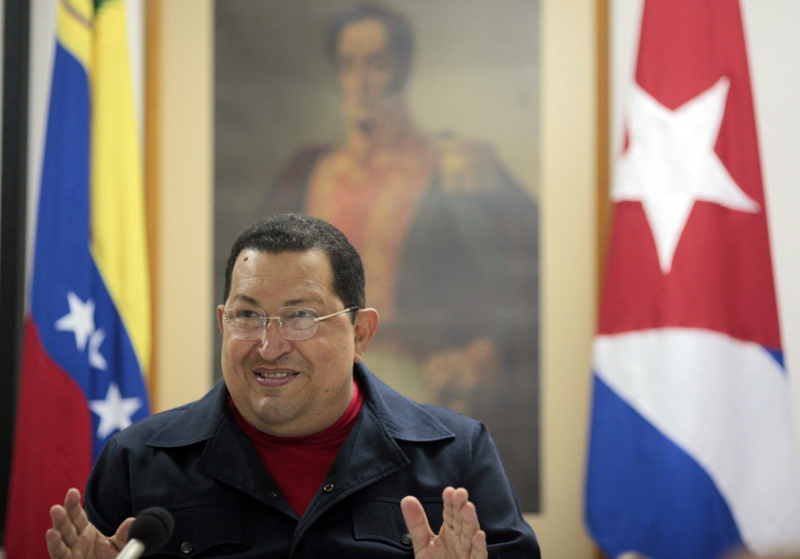 Venezuelan President Hugo Chávez said that the tumor removed by Cuban doctors last week was found to be cancerous. "Chavez, making his first television appearance since traveling to Havana Feb. 24 to undergo surgery, didn't say when he'd return to Venezuela, where he's preparing to run for re- election in October. "'As I said in Caracas, it was most likely that the lesion was malignant,' Chavez, wearing a red shirt and surrounded by members of his Cabinet, said on a video recorded March 3 in Cuba and broadcast on Venezuelan state television yesterday. 'The entire lesion, measuring two centimeters, was removed. But almost everything indicated that it was likely cancerous, what they call a recurrence.'" The AP adds that Chávez also said he would spend several weeks in Cuba recovering, and then start radiation treatment, "without discarding other treatment options," the AP quotes him as saying. According to Reuters, Chávez also struck a confident note. "I will live! I will overcome," he said.